Today we will discuss here about some standard errors comes in joomla website development. Generally this error comes when we are using ereg() functions. There is a standard solutions of it by using preg() function instead of ereg() function. Because ereg() functions are deprecated. This type of errors because of some minor mistakes we made or it is in the module file that we use ready made. and you are getting error like Call-time pass-by-reference has been deprecated than you have to just remove the & before $this. Generally this error comes when we are using split functions. There is a standard solutions of it by using explode() function instead of split() function. Because split() functions are deprecated. Go to Admin panel > Global Configuration > Server > Mail Settings > Mailer and select SENDMAIL there,instead of PHP MAIL FUNCTION. After making a joomla site many developers faces the problem of removing the index.php from the url. 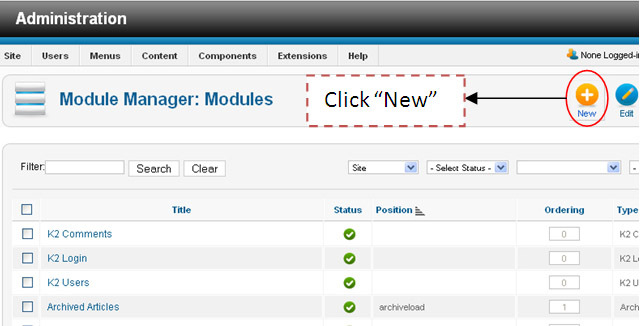 • Go to the Global Configuration area within your Joomla admin. These were some standard errors comes in joomla website development. Solve and Enjoy. For Customizing joomla front page, there are so many methods and modules for customizing home page with your articles layout. But below code works at module level where you want to display some module only on front page, not other pages and some module display only on other pages except front page then this code is useful. You can write the code given below in index.php in your template folder where you want to put module on front page, put below condition with your HTML code in index.php file. Here i have shown two methods. Both are working well. 2. This method works front-page component. How to add New field in Virtuemart 2.0? If you need an additional field for your own business requirement, you can do that by changing data model as well as some php code. To add new field for product you have to make changes in php code of 3 or more separate files in the previous Virtuemart joomla 1.5 but in virtuemart 2.0 and joomla 1.7 version you only have to make change in only one file to add field. To add field in virtuemart admin side, first you have to create field in your product table into database then you need to add field for product in virtuemart. Add this type of code wherever you want to put new field. When I installed Rockstories modules in my Joomla site. I couldn’t see in Module manager. I tried wasting lots of time but after sometime I got solution. 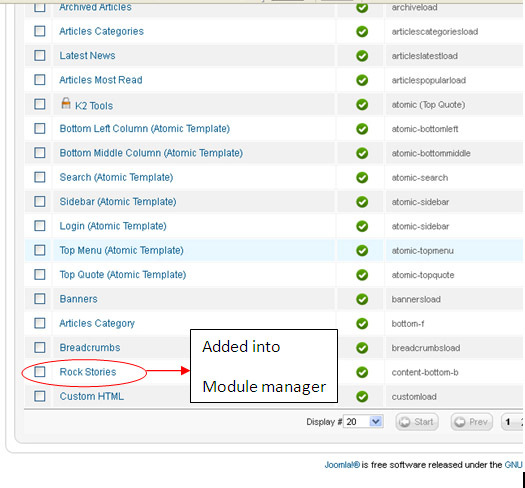 And now I can see Rockstories module in Module manager. Now it’s listing with other modules. 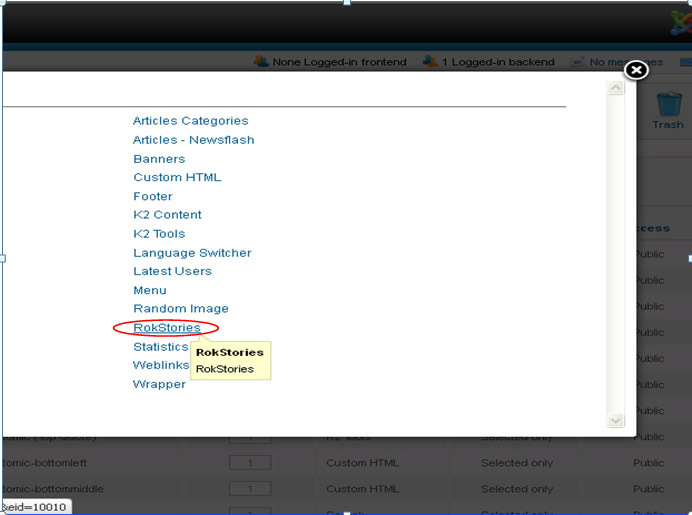 1) After installing Rockstories Module from Extension Manager, you have to follow following steps. It will opened lightbox window, now you can see that module and click on that one so it will added in Module Manager List. Now, we can see it in Module manager. After installing process, you can customize in front in Joomla site.